The Elkhart County prosecuting attorney's role in the criminal justice system is to enforce the laws of the State of Indiana and hold criminals accountable for their behavior. There are several steps in this process. Click the name of a step below to learn more. Providing immediate, accurate and detailed information to the police is extremely important to an investigation. Once the authorities are notified of a crime, an investigation can take place which documents or collects evidence which can later be used to prosecute the suspect. Due to the stringent requirements of the law, proving an individual is guilty requires an investigation and the documentation and collection of evidence. The more complex the case, the more investigation is needed. Once the investigation is complete, the Prosecutor reviews the investigation to ensure that all legal requirements of the alleged crime are satisfied by proper evidence and the investigation has shown that no other person is likely to have committed the crime. If an individual is arrested for a crime, he or she is taken to an appropriate holding facility (jail) and held there until he or she posts a bond guaranteeing their appearance in court, or until his or her case is concluded in a court. Some people who are arrested are permitted to be released on a program called "Pre-Trial Release". This program is designed to monitor the behavior and whereabouts of low-risk persons as they continue to live in the community until their criminal case is concluded in a court. 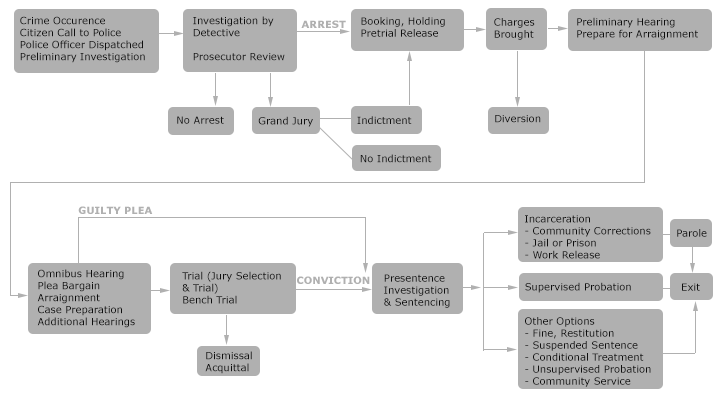 After the investigation is competed to the level where it is clear to the Prosecutor that a crime has been committed, and the suspect is the perpetrator of that crime, the Prosecutor evaluates the case for charges. The Prosecutor must consider not only the quality of the evidence available to prove the case, but also whether the criminal charges should be pursued in light of the circumstances of the offense and any other appropriate considerations. Shortly after an arrest, a Probable Cause hearing is held where a judge or magistrate reviews the facts supporting the arrest and determines whether the arrest was appropriate. At the Initial Hearing, or Arraignment as it is also called, a defendant is advised of his or her Constitutional Rights, the potential penalties of the crime charged, and any deadlines he or she must meet. The Court also determines whether the defendant will hire a private attorney or will qualify for a public defense attorney. Additional Court dates are also set at this hearing. If an extensive investigation is needed to document or collect evidence, the suspect will not be arrested until the proper information is obtained. This is to ensure that the suspect's rights are protected and the investigation has shown that the suspect is the person who has committed the crime. If the case involves highly sensitive political matters, police shootings, or other an issue of highly debatable public concern, the Prosecutor may empanel a Grand Jury to determine whether a suspect should be charged with a crime. The Grand Jury is made of up citizens of the community that are not disqualified for purposes of bias, physical or mental infirmity, or other specific conditions might result in an unfair proceeding. If the Grand Jury finds "Probable Cause" that a suspect has committed a certain crime, a "true bill" is returned and the suspect is charged with that crime. This is known as an "Indictment" and the "suspect" is now considered a "defendant." If the Grand Jury does not find "Probable Cause" that a suspect has committed a certain crime, a "no bill" is returned and the suspect is not charged with the crime considered by the Grand Jury. If a case is charged, certain defendants are offered a chance to avoid a judgment or conviction if they qualify for a diversion program. The Diversion program allows certain low-risk defendants who have been charged with very minor offenses to avoid a judgment if they maintain good behavior, reimburse any financial damages to an injured person, obtain treatment and follow-through, if required, and pay processing fees. At the Initial Hearing, the defendant is advised of future dates such as the Omnibus Hearing, Plea Bargain Deadline, and a Trial date. The Omnibus Hearing is usually just a deadline by which certain motions and defenses must be filed such as a Notice of Alibi or an Insanity Defense. Some Courts also treat the Omnibus Hearing as a status conference for the attorneys involved to discuss plea negotiations and exchange of information. The Plea Bargain Deadline is the date upon which the defendant must formalize any plea agreement with the State of Indiana. Due to the number of cases prosecuted in Elkhart County, virtually all defendants are offered an opportunity to plead guilty to a charge rather than have a trial. Plea offers are made after the Deputy Prosecuting Attorney has evaluated the facts of the case as well as the character of the defendant. If there is a "victim" of the crime, that person is permitted to express his or her position regarding any plea offer proposed to the Court by the parties. If the defendant in a criminal case does not enter a plea of guilty, a trial is held where either a judge, or a jury, determines whether the facts of an alleged crime have been proven by the evidence submitted by the State of Indiana. Trials in misdemeanor cases are often held for a judge to make the decision on guilt. Trials in felony cases, especially major felony cases, are normally held for a jury to make the decision on guilt. Depending on the complexity of the case, a trial can last anywhere from a few hours to several days. If the judge or jury determines that the defendant is not guilty of the crime charged, the defendant is released and the case is concluded. The State of Indiana may not retry the defendant for the same crime once he or she has been found not guilty, or acquitted. In some rare occurrences, either the State of Indiana, or the Judge, may dismiss the criminal case. If this occurs, the defendant is released and the case is concluded. The State of Indiana may only re-file charges against a defendant in certain limited circumstances. Once a defendant has been convicted, the Court has several options from which to choose an appropriate sentence. The severity of these sentences ranges from paying minimal or no fines or being on "good-behavior", to serving a term of years at a State penal institution. The Court may sentence a person to probation, community service, payment of restitution, home incarceration, and work release. The sentence depends upon the nature and circumstances of the crime as well as the character and "risk" of the defendant. Once convicted, a defendant is afforded an opportunity to challenge that conviction either by appealing the case to an appellate court (the Indiana Court of Appeals, or a Federal Court of Appeals), by fling a Motion to Correct Errors with the Court that entered judgment of conviction, or by filing a Petition for Post-Conviction Relief. All of these procedures must be initiated by a defendant and most must be initiated within a short time after the conviction is entered. Due to present laws in the State of Indiana, a defendant sentenced to a period of incarceration is usually released from prison much earlier than what the original sentence indicated. Indiana laws allow defendants to earn credit time for compliance with administrative rules at the Department of Corrections. Once a defendant reaches a "Class I" credit class, he or she earns one day of credit for every day actually served in confinement. As such, a twenty (20) year sentence for an armed robbery could result in a defendant being released from confinement in ten (10) years or less. The term "parole" is an administrative term used by the Department of Corrections for individuals who have been released from custody early, prior to their term of years (including credit time) being served. These individuals are under supervision of the Indiana Department of Corrections, not the County of Elkhart.